As content marketing evolves, one thing gets clearer and clearer: Good content doesn’t just “float to the top”. It doesn’t automatically get people’s attention. You’ve got to promote it. You’ve probably heard “just because you build it, doesn’t mean they’re going to come,” said about websites. That’s true of content now, too. Even if it’s good. 50% of articles get eight shares or less. Eight shares barely covers the blogger queuing up a couple of tweets. It suggests most content is not even sort of reaching its audience, much less getting links or comments. It suggests that most content fails. Now, I don’t want to be too much of a downer. “Fails” is a tough word. Hopefully, your content is getting way more than eight shares per piece. But even if you are in the top 1% of content marketers, there’s always room for improvement. Most of us could definitely improve our content promotion. That’s actually good news. Really. Because promoting content is easy. Once you’ve set up a routine – basically a checklist for promoting your content – you can just buzz through it after you publish. And for larger pieces of content, like ebooks and webinars, you just can add in a few more tactics. Sound doable? I hope so. But here’s the rub: Content promotion does take time. And it has to be done right after you publish, or even before you publish. The timing can be a challenge. Usually, after we’ve published a post, it feels like time for a break. You just poured all this time and energy and focus into creating the best post possible, and you’re tired. I sympathize. After I finish my posts, I’m pretty worn out too. That’s why it’s better to have a checklist, or to build a promotion “habit”, if you will. It means you don’t have to recreate the wheel every time. Once content promotion becomes a habit, it gets much easier. So if promotion is no longer optional, exactly how much of it do we need to do? As long as it took you to create the content in the first place. That’s the general rule for how much promotion each piece of content needs. Does that sound like way too much? Marketers like Derek Halpern advocate spending five times as much time promoting your content as you did creating it. I’m going easy on you. Some marketers also believe you don’t just put in as much time promoting your content as you did creating it. They recommend spending as much money promoting your content as you spent creating it. So if you’ve just spent $200 to get a blog post written, you’d spend $200 promoting it. And some people go even further than that: One marketer I write for spends $1,400 promoting each post. More about that in a moment. As you can see, over half of the bloggers spend between one and three hours promoting their content. For the sake of simplicity, let’s pretend you’ll spend 2 hours promoting your next piece of content. Let’s say it’s a blog post. As you can see, most promotion is happening on social media. And about half of marketers are also working their SEO to get some traffic. Almost half use email. Almost one in four use influencer marketing. Paid services, while still a really small slice of the pie, are being used by twice as many bloggers as the year before. It’s interesting to see so few bloggers using paid services. This may be because the bloggers Orbit surveyed are just that – bloggers, not large content marketing departments. Among larger, better-funded content marketers, there’s much more paid promotion. Large companies usually refer to paid promotion as “paid media”. It’s part of a classic promotion setup: Paid, earned and owned media. Even if your business isn’t in the big leagues yet, you should be aware of those three types of promotion. You may want to try to do at least a little bit of all three. Forrester Research has a nice chart that explains the differences between the three types of media. Even this chart might need some explanation for smaller companies and bloggers. The owned media part is pretty straightforward – anything you own qualifies. So your site, your email list, your app, and your social media followers are all owned media. Paid media is also pretty easy to understand. It’s advertising. Anything from promoted posts on Facebook to display ads or even solo ads in email messages are all paid media. Earned media was traditionally the domain of public relations people. And, for big companies, it still is. 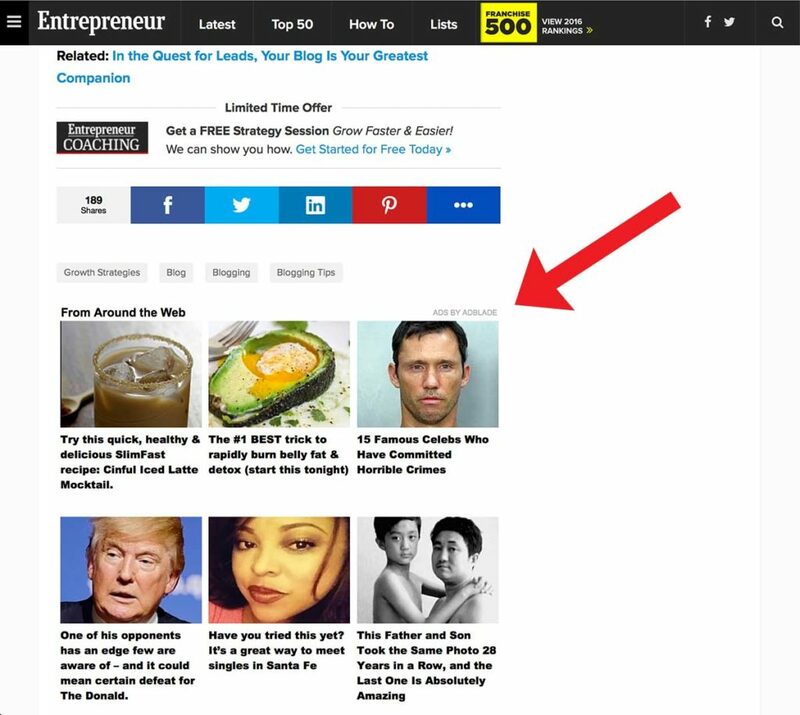 Getting a story about your startup into a magazine like Fast Company is an example of earned media. So would be getting an influencer to share your content. Or getting another blogger to link to your content. Of the three types of media, owned media is the best. It’s mostly free to use, and you’ve got complete control over how your content is presented. Paid media, of course, requires a budget. Sometimes a large budget. You also may not be able to control everything about how you present your content in paid media – kind of like how you have to get Facebook ads approved. Earned media is free, but you lose a lot of control about how your content (or your company) is described. Technically, even a negative review would count as earned media. Queue up a tweet to be published once a day for the first week, every other day for the second week, and then every 3-4 days for the next month. 10 minutes, max. Write 5 different Facebook posts. Publish the first update the day you publish the post. The second update gets published three days later, and then the remaining three updates publish once a week. 20 minutes. Use those same posts on Google+ and on LinkedIn. Edit them as necessary for those platforms. 15 minutes. 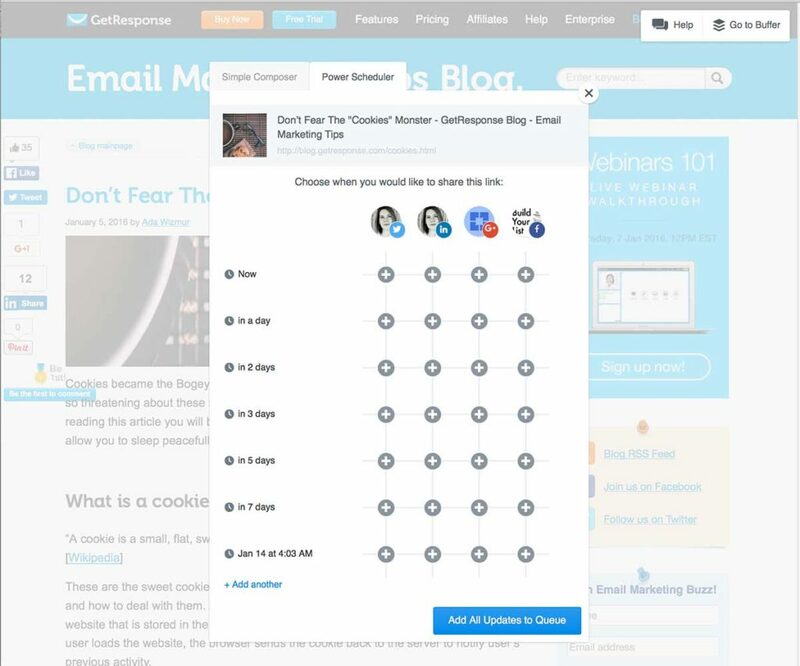 Buffer’s Power Scheduler makes it easy to queue up a bunch of posts fast. Creating a simple infographic for Pinterest. If your post was a listicle, or could be made into a list, reformat it for List.ly. Create a SlideShare version of your post and publish it there. Announce your post on a couple of forums, or on a LinkedIn group or two. There’s a tool called BuzzBundle that automates finding online discussions about a given topic. Bookmark or share your post on sites like Reddit, Digg, StumbleUpon, and Delicious. Notice how some of these “content promotion” tactics are basically content reformatting? That’s not cheating – it’s just remaking your content so it gets seen by as many audiences as possible. That’s the very definition of content promotion. This could be broken into two activities: Making your content SEO friendly, and doing some link building. If your content is on WordPress, the best and fastest way to make it SEO friendly is with the WordPress plugin Yoast SEO. It’s free, and there’s a good tutorial here on how to use it and how to optimize any content for SEO. Unfortunately, doing a decent job on SEO is probably going to take about 20-30 minutes, which means you’ve spent most of your time budget. And we haven’t even talked about link building. You could easily spend an hour or two there. As you know, link building has become much more about “quality over quantity”. So while there are still plenty of ways to get links, always aim for quality. In terms of content promotion, you could lightly rewrite your post and then publish it on LinkedIn, Medium, Business2Community, or any of the other quality sites that accept republished posts. So once again, reformatting your content can become a way to promote it. This one’s easy. 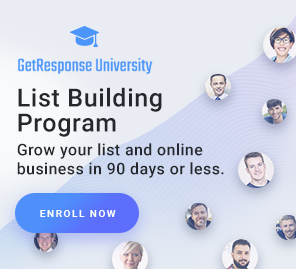 If you’re reading the GetResponse blog, I’m pretty sure you’re doing email marketing, and you’ve got at least a small email list. So spend about 20 minutes creating an update about your new post. Toss in any additional news you’ve got to share, too. Ah, here’s a lost opportunity. Many of the most successful bloggers (like Adam Connell of Blogging Wizard) recommend influencer marketing. They say it’s arguably the best content promotion tactic. Trouble is, you aren’t going to get it done in 10 minutes. Okay, maybe you can reach out to one influencer in ten minutes. Go to BuzzSumo, add the primary keyword that relates to your post, and then go find who’s shared related content the most. 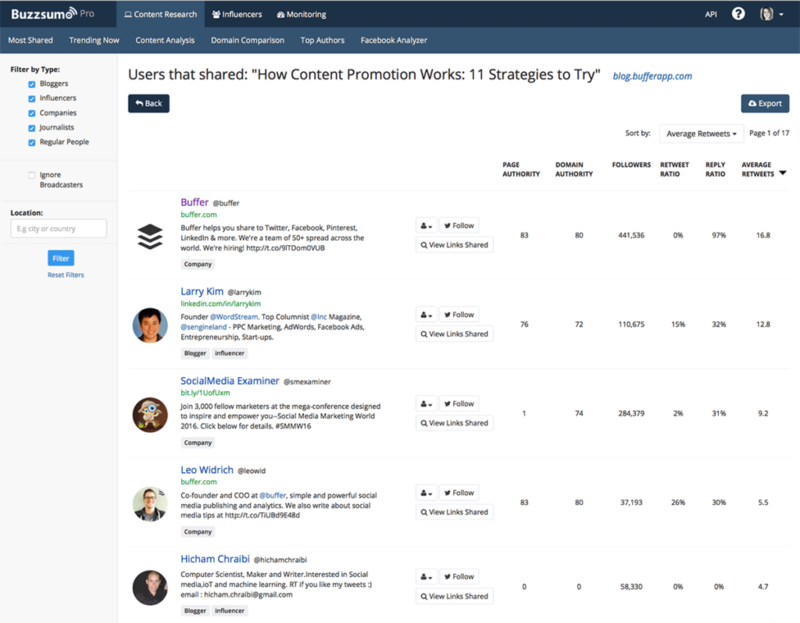 BuzzSumo lets you see who’s shared a piece of content the most. That will get you started. Another way to find influencers fast is to see who’s shared your content in the past. Those people are far more likely to share your content again. Reach out to them via Twitter or email. There are dozens of other ways to get influencers’ attention. It’s a science and an art. If you’re serious about doing more influencer outreach for your content, check out NinjaOutreach. It can automate some of the process for you. And, if you’ve got budget, they’ll even do the outreach for you. BuzzStream is also good. There’s far more to do with paid promotion than can fit in seven minutes. But these time allocations are just examples. So let’s look at what you might do, even with a modest budget. The first place to start would be with Facebook advertising via dark or boosted posts. That can get you a reasonable bit of exposure for $20 or so. And then there’s Twitter advertising, too. LinkedIn also offers advertising, but I’ve always found it way too expensive (about $2 per click). Pay per click and the AdWords display network are also options. If you’re really good at them, it is sometimes still possible to get clicks for less than 50 cents… but not often. You’re more likely to have success with any one of the content promotion platforms. Places like Outbrain, Taboola, AdBlade, StumbleUpon, and Reddit will all let you promote your content. In my experience, StumbleUpon is the cheapest of the bunch, but your mileage may vary. Finally, there are services that let other users share your content, either for free or for credit into the system. JustRetweet is one example. Their users can choose which pieces of content to promote, and they get credits for each piece of content they promote. ViralContentBuzz and Triberr are similar. And then there’s the new kid on the block, CoPromote. Just as with influencer marketing and link building, you could spend a week promoting content via paid channels. Do me a favor, though: Track how many conversions or sign-ups you get from that paid traffic. No sense spending money on traffic that doesn’t convert. Reach out to anyone you mentioned in the blog post. If you said nice things about them, they might share the post with their audience. If you published anything newsworthy, consider a press release. Ask people in your company to promote your content. Create a “wolf pack” of people in your industry whose content you admire. Make a pact that you share their content and they share yours. There’s days worth of potential promotion work you could do for any piece of content. But before you invest too much time, please make sure the content you’re promoting is worth it. If that means you have to create less content this year, maybe that’s not entirely a bad thing. Besides, if you do even a quarter of the content promotion I’ve mentioned here, you’ll probably get way more results from your content than you did before. There are dozens of content promotion tactics I haven’t included here. If I’ve missed your favorite technique, please speak up in the comments. We’d really like to know what’s been working for you.